Vehicle no.509 from Greppert and Kelch. Vehicle no.509 from Greppert and Kelch,Germany.Wind up car.Boy rocking when the car moving forward.Good condition. An early rare piece(See Schulte-Kellinghaus,Die Anderen Brandenburger,Borch-Druck Verlag 2007,p.160).Working fine.L= 11 cm/ 4 3/4 inch. 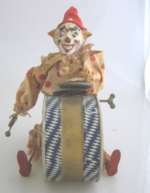 Hand painted clown from Leonhard Staudt,Germany An early piece from about 1905.Playing drum and kettledrum by wind up.Leonhard Staudt is one of the oldest toy factories in Nürnberg,Germany.Founded in 1860. Working fine and all original.Good condition,but some spots on the face. H= 18 cm/ 7 1/2 inch..
Small German petrol lorry made of tin.2 drivers in drivers cab.The lorry is from the 30es and probably made by Fischer,Germany.Wind up and working fine.Is in good condition,but the are some smaller spots after labels on the roof. Rolly nr. 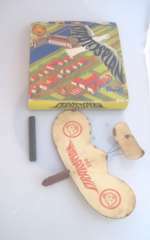 74o2 made by Schuco,Germany in the 1950es.A wind op toy:Monkey on skater.Moving forwards.Very good condition.All is original.H= 22 cm/ 9 inch..
Steiff Stratosplan with patent no.520 DRP from 1930es.Nice little glider with an original box.Both are in a fine condition.Wing span = 21 cm/ 8 2/3 inch.. Box = 18-18 cm/7 1/4-7 1/4 inch. Horse pull toy with bell.Bing.Germany. Antique tin toy:Mickey Mouse the music player.Comic. H. 7 1/2" x 6" ( 19 cm x 16 cm) Mickey Mouse Playing Xylophone. Clockwork tin toy. Walt Disney production from the 50-ties. 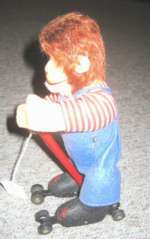 Made by Linemar.Fine working condition.Comic toy, Movie collectable.